The Latest Draw For The Express Entry Pool Took Place On September 20th, 2017. 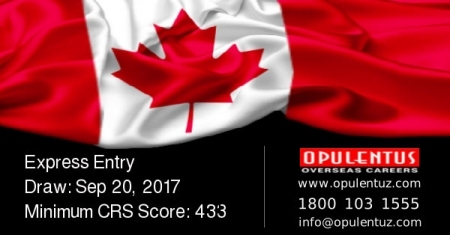 The number of CRS points required to receive an Invitation to apply for immigration to Canada through this selection system now stands at 433, which is the joint-lowest cut-off threshold, since June, when the changes were introduced to the system. This is two points lower than the previous draw, held on September 6th, which had a threshold of 435. Candidates receiving the Invitation to Apply are given a period of 90 days to file their complete application for PR, with the supporting documentation attached. Immigration Regulators aim to complete the entire processing, within six months. When the Express Entry was introduced in Jan 2015, several applications have been processed, within this six-month timeframe. With this draw, the total of ITAs issued, so far during 2017 is 69,420. By comparison, the ITAs issued, during the entire 2016 were 33,782. The total of ITAs issued since Jan 2015 now is 134,265. The program has an aim to simplify and accelerate the permanent residency immigration process, and the draw date is highly anticipated and awaited. We aim to extend a helping hand in meeting your requirements for success in such Canadian programs. For all the avenues available to a candidate, please contact us at [email protected] or call us 1800 103 1555.